So. This tart is obviously only for coconut lovers! The crust is just a bunch of coconut products and salt. There’s shredded coconut, coconut flour, coconut oil, and coconut sugar (and coconut milk in the pudding filling!) If you want to add a little different flavor, you can add some lime zest. Note that if you use coconut sugar (instead of raw sugar, which I did) that your crust will be a little darker. My favorite part is that you just press it all in so you don’t have to worry about rolling out the crust – perhaps my least favorite baking task! Speaking of shredded coconut, I wish there were some consistency with the names of dried coconut products. What one company calls shredded, another calls flakes, and what one company calls chips are flakes with another company. And don’t even get me started on coconut flakes and flaked coconut. The coconut on the left is what I normally use. It’s German desiccated coconut. Sometimes the bags say “coconut flakes” in English, just to add to the confusion. 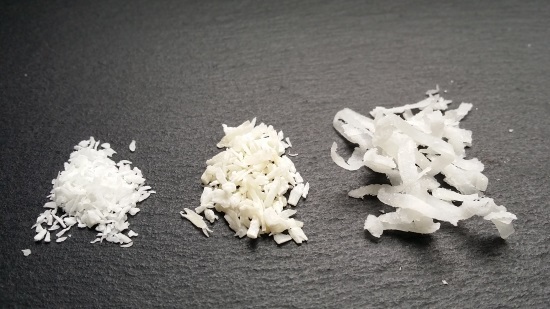 Desiccated coconut is supposedly drier than shredded coconut, but compared to Bob’s Red Mill’s shredded coconut (pictured in the middle) it’s exactly the same except the shreds are a little smaller. Those two are totally interchangeable. But that stuff on the right? Definitely not interchangeable in some recipes (like this one!) It’s store-brand shredded coconut from a grocery store in the US. The shreds are way bigger, seem moister, and it’s often referred to as flaked coconut. I’m telling you – it’s chaos in the dried coconut world. Anyway. This tart! The filling is the vegan coconut pudding that I posted a few weeks ago. That pudding is so thick that it works perfectly as a tart filling. Plop some berries on top and you’ve got yourself a pretty darn easy to make tart. Some added toasted coconut chips would have been even prettier and I’m totally kicking myself for not thinking of that earlier. 2/29/2016 update: I made this pudding with arrowroot starch several times for a grain-free and paleo version and it worked great! But I just tried it with another brand and the pudding is quite grainy. Until I test a few more brands, I’ve removed the arrowroot option! Mix all the crust ingredients together and pat up the sides and over the bottom of the pan. Bake for 8-12 minutes or until lightly browned. It'll go from totally white to browned and then burned in moments, so keep a close eye on it! Let the crust cool completely, about 30-60 minutes, and then refrigerate until cold and firm. Remove the pan from the heat and stir in the cornstarch mixture while stirring constantly. Once well combined, put it back on the stove, turn the heat to medium and cook until thickened like pudding, whisking constantly (do not walk away and do not stop whisking!). This will take anywhere from 30-60 seconds (some commenters have needed up to 3-4 minutes). Do not let it continue cooking once it's thickened - this can cause the cornstarch to break down and will make the pudding runny. Let cool until room temperature and then pour into the chilled crust. Chill for about 1 hour before topping with raspberries. Up to about 4 hours before serving, top the tart with raspberries. The tart keeps well for up to about 2 days, but is best on the first day. The crust will remain firm as long as it's refrigerated. Cut what you need and then return the tart to the refrigerator to prevent the tart from soaking up the pudding and getting soggy. 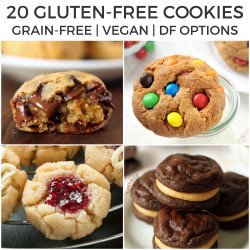 Make sure to use certified gluten-free products, if necessary! 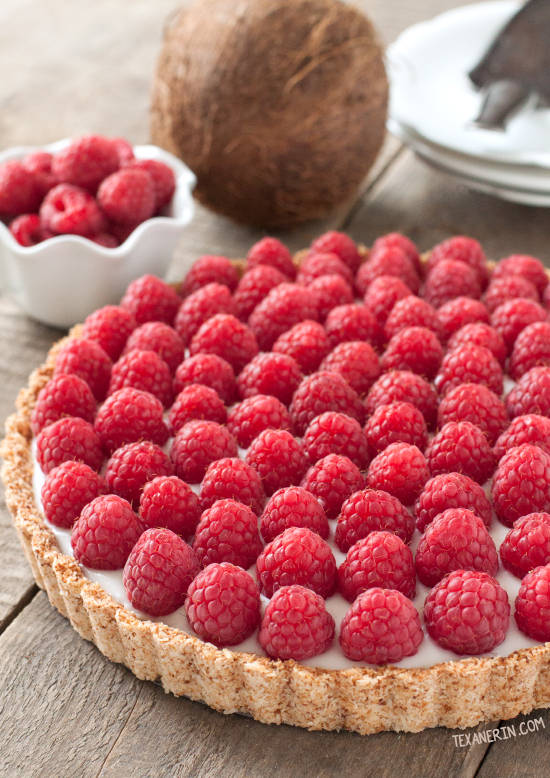 65 comments on “Vegan Raspberry Coconut Tart” — Add one! I haven’t tried it so I really can’t say for sure. My guess would be that it’s okay but it’s really just a guess. Sorry I don’t have a better answer for you! I’ve never used agar agar so I unfortunately have no idea. Butter is 80-82% fat and coconut oil is 100% fat so I would really recommend coconut oil. You could try butter, but it’ll likely come out crumbly. Sorry about that! If you don’t have coconut flour what amount of all purpose would you recommend? It’s not interchangeable with any other type of flour as it absorbs so much more liquid. Sorry about that! I just wanted to add how badly I messed this recipe up, but in the end it some how managed to turn out, I would definitely try this again with more sleep prior to making this. Tastes great. Holy cow!! Came across this beauty on Pinterest. I made it last night and it turned out amazing! Not too sweet, not overly coconuty…just the perfect amount of everything. Thank you so much for sharing this! You’re welcome! I’m happy that it worked out well for you. :) Thanks a ton for your feedback! Delicious recipe! And so easy too. I actually made six 4” tarts out of this (had some leftovers, could have probably made seven). They turned out great! One comment: After adding the cornstarch and replacing the saucepan on medium heat, it took much longer than 30-60secs for the filling to thicken up. I whisked constantly and it maybe took 3-4mins—but thickened nicely. Thank you for making an easy, straight-forward recipe for us non-vegans our there! It’s tough when hosting vegans to make something yummy that doesn’t require a bunch of crazy ingredients I’d never use otherwise. Thank you! How important is a tart pan with removable bottom? I don’t have a tart pan & am making this in a bind & kind of in a hurry. Would a glass pie pan work? I haven’t tried it but I don’t think it’d work very well. I think it’d crumble when you cut into it. I could be wrong, though! I made this last week. Turned out perfectly. I added lots of lime zest to my crust and it was so refreshing. Never had a problem with it. I made it with fresh picked wild blueberries instead of raspberries. I warmed them on the stove til they got plump and burst a bit, added some corn starch to thicken and it was AMAZING! Best EVER! Yum! I love your blueberry version. I’ll have to try that next time. :) I’m so happy that the tart came out well for you and it was problem-free. Thanks a bunch for your feedback! Did anyone else have an issue with the oil leaking in the oven and burning? My whole house FILLED with smoke. The crust wasn’t burning, but apparently coconut oil seeped through my tart pan onto the bottom of the oven and created a disaster. Just a heads up… you may want to put a cookie sheet or foil on a rack below your tart pan. It may avoid this. Oh no. I’m so sorry to hear that! I’ve had that happen to me with other recipes and I know how awful it is. I use a tart pan with a removable bottom and have never had an issue with this recipe. I’m really not sure what could have caused that for you. Did you make any subs or changes at all to the recipe? I forgot to say the pudding is great. Waiting for it to set before we try, but smells great! Since when is cornstarch paleo?? I’m aware that it’s not. Check out the last paragraph of the post. I’m not able to change the url of the post, unfortunately. All other mentions of paleo have been removed from the post until I can test with more brands of arrowroot. Is “full fat coconut milk” = coconut cream? I have coconut cream which is 17% fat or coconut “liquid” which is 5-7% fat, which would you recommend to use? Currently making this for Easter and waiting for the pudding to reach room temp. My one comment to improve the instructions is that it is unclear if it should take 30-60 seconds for the filling to thicken once you begin stirring, or is it once it starts to thicken, which could take 5-7 mins, it will only take 30-60 seconds to get thick….that was more of the experience we had. We ended up adding one more tablespoon of cornstarch…hope we didn’t screw it up! I just went and checked mine and it’s 19% so I don’t think that was the issue. I’m sorry it didn’t set! I know you said followed the instructions to a T but I just want to make sure – you used 7 tablespoons and not 7 teaspoons of cornstarch, right? And did you put the pudding in the tart crust? If not, I think it may still work if you go and heat it up again. It should be thicker than just coating the back of a spoon. It should be about as thick as regular pudding. :) I’ve made this several times and never had an issue with it so the only thing I can think of if you put in the correct amount of cornstarch is that my stove runs hotter than yours. Or I wonder if stabilizers can cause an issue! My coconut milk doesn’t have anything added to it. Does yours have any gums or other added ingredients? Sorry again it didn’t work out! Oh, yay! I’m very happy to hear that. When you said try it tomorrow, do you mean that you made the pudding yesterday but didn’t actually taste it? Because that’s crazy. ;) Awesome self-control you’ve got there! Thanks so much for coming back to let me know that it worked out. I was super relieved to read that! Oh of course I tried the pudding!! I almost expected all of the coconut would be overwhelming but it’s not, It’s absolutely amazing!! I meant try it as a finished slice ;) I am eagerly waiting having it as a desert tonight.. And probably again with my coffee tomorrow morning!! Thank you for the help! Woohoo! That’s great. :) It’s one of my favorite puddings and I’m not even all that wild about coconut. Thanks again for your comments! Thanks, June! It’s definitely a favorite of mine. Raising my hand here as a lover of “all things coconut”. I know I would love this tart! And yes to the confusion over the coconut shreds/flakes/etc. There needs to be a coconut convention where they all decide on a consistent way to make and name the stuff! It’s not just coconut that’s confusing! I’m from Australia and we don’t jab the same products as everyone else; Cool whip, fluff, candied bacon, instant puddings, canned pumpkin. We’ve only recently discovered Reeces Pieces!! You should be happy you don’t have fluff and whipped topping. ;) Canned pumpkin though?! That stuff is SO convenient and in my opinion, tastier than homemade. We don’t have Reese’s in Germany but I sure wish we did! Totally crazy how coconut is so different all over the place! Either way, I love the stuff so this tart is feeding my heart. And it’s paleo and berrylicious? I love you. Pinned! Thanks so much! I’m happy to have fed your heart, if even just a little. :D And thanks for pinning! I didn’t use to really be into coconut but that all changed when we went to Hawaii last year! My husband adn I fell i love with it and now we can’t get enough! This tart is gorgeous! It’s days like this that I wish I developed a taste for coconut. I don’t know what it is and people always think I’m crazy! Seriously though, a gorgeous tart and it could convince me to take a bite! I didn’t really like coconut until a few years ago so I totally get it! It was a texture thing for me. *Raises hand* I’m a coconut lover! 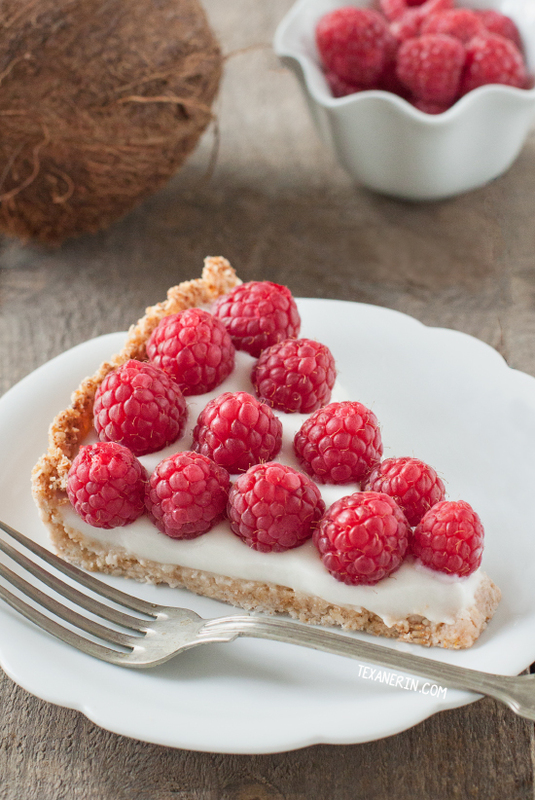 :-) I’d totally enjoy this gorgeous tart with all of it’s coconut-ty goodness! Why have I never thought to make something with a coconut crust?? I’ve never even come across that – what a smart, delicious & creative idea! Gorgeous tart!! Thanks, Colleen! And I hope you can give the coconut crust a try. It’s so yummy! 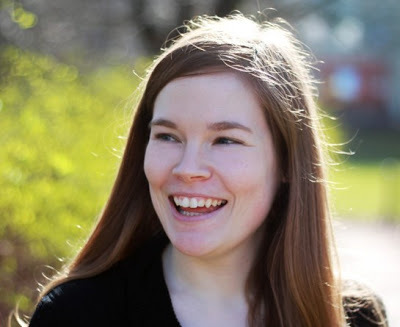 You make all your desserts and everything you blog about beautiful! Great photography! That filling is so beautiful and downy white…plus the berries are such a lovely complement! I can find some great dessicated coconut at one of my local markets, and try to stock up when I’m there. Beautiful tart! I love it when desserts are almost too pretty to eat, like this one! This is a beautiful tart and that pudding sounds delightful. This tart looks incredible! That coconut pudding? I would go to town on that with a giant spoon!